What's on my mind? HAIR! Guess who's on the Etsy Blog? I mentioned a while back that I re-did my studio. Previously, it was painted a horribly depressing beige... the walls were cracked, and it was generally a pretty ugly space. So, with the help my my BFF Abbey, we patched the cracks, painted furniture, evened things out, and painted the walls (two shades of) white. I used all of the furniture I had in there before, which was an antique table from an auction sale, two Ikea book shelves, and a custom built sewing L-shaped table (got it as part of a trade). I added a small vintage cabinet to store boxes and odds and ends, as well as two rods to store spools of elastic. The new layout is SO much better, with the cutting table in the centre of the room. Overall it just feels so much brighter and inspiring. I really, really love being in this room now. I like it so much, I now want to paint everything white! It just looks so good, especially in a house like ours, which is pretty dark (small windows). Our house is a smaller, three bedroom house. This room used to be the master bedroom... we decided (well, truly I decided) the space would be better used as my studio and we moved into one of the smaller bedrooms. Best decision I ever made. Our bedroom feels nice and cozy and I now have a studio that's big enough for two people and a baby to work in. It can be hard to make everything "fit" in a small house, but I've found that downsizing furniture scale as we can afford to do so and frequent de-cluttering sprees. So much of our original furniture was stuff handed down to us, and it just didn't fit our small space. As we've lived here longer we've invested in more storage and more compact pieces... it makes a world of difference. I'm really starting to love our little old house! Big thanks to Shutter Owl Photography for the beautiful photos! Just for fun, a photo of me and Izzy. Your new space is beautiful! It's nice that you can fit your whole clan in it. Company can be delightful when you're putting in a lot of hours sewing. Also, your necklace is AWESOME! It's wonderful! 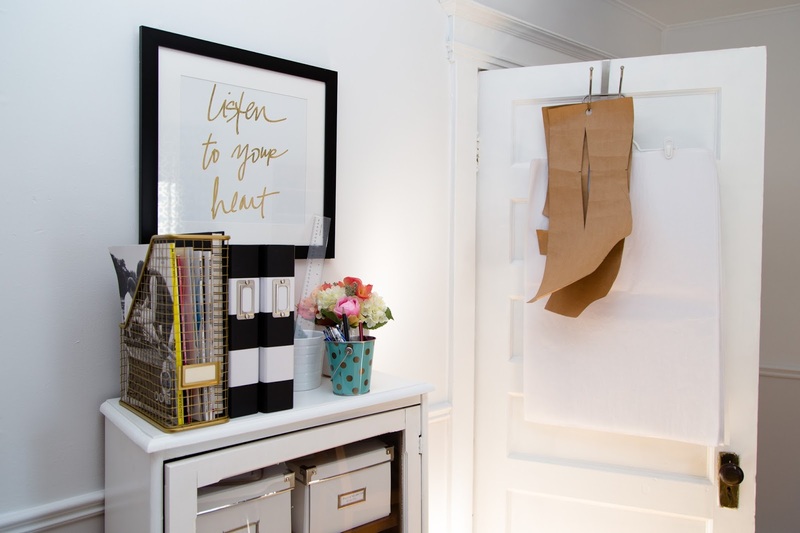 So light, airy and organized. 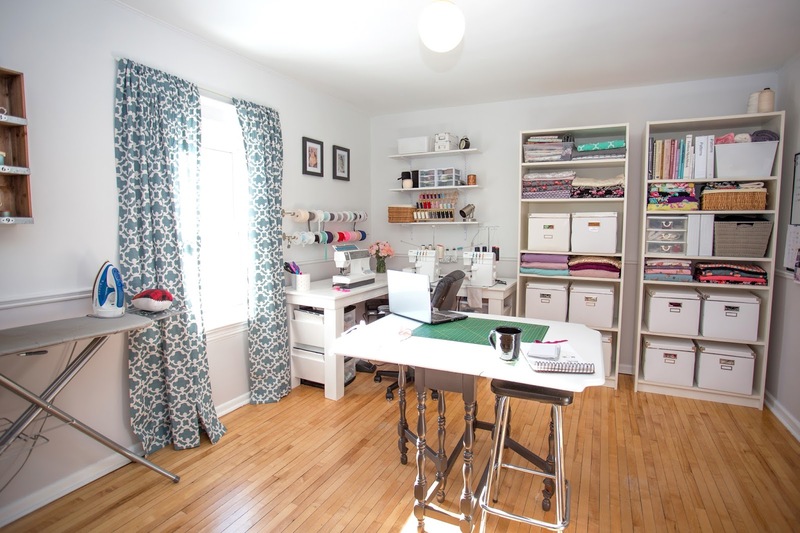 I'm still totally jealous of your sewing table; the L-shape seems so ergonomic and space saving! 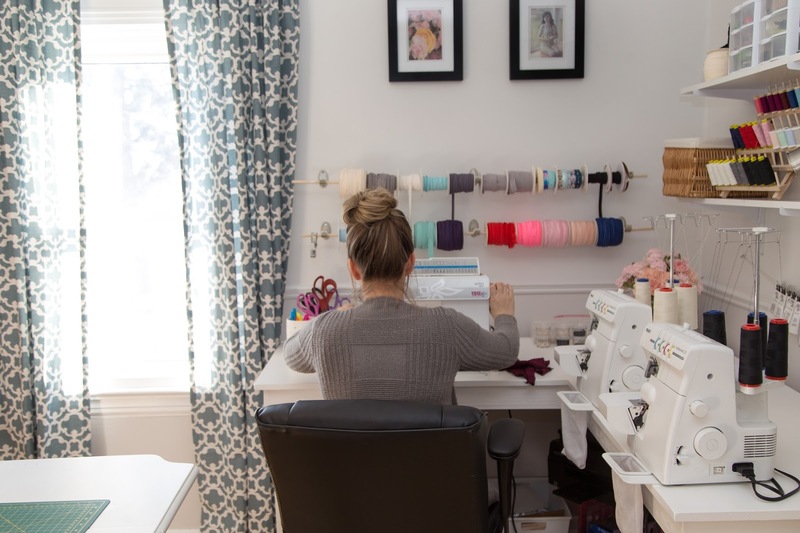 I love it because I can swivel between sewing machine and serger! Your studio looks so cozy and inviting. Perfect for creating all sorts of beautiful things! And hmm, now I'm considering an L-shaped sewing table when I re-work my room. Beautiful studio, and adorable baby girl! Thanks for sharing your lifestyle. That's so inspiring how you arrange and able to fit all the furniture in your tiny house.